'Experience marketing' is a fancy term for something that actually works: going up to your fellow students and familiarising them with your organisation. Events, whether big or small, are often the perfect inducement for face-to-face interaction. Face-to-face communication works, as personal contact can make a difference in this age of digital overload. At first glance it might seem a bit unusual to promote 'real life' interaction as a communication strategy in this day and age, but it is actually very logical. After all, a great deal of successful digital communication stems from actual, physical networks - personal relationships between people. In addition, numerous social media platforms strengthen existing networks. In other words, you will not automatically reach new people with your Facebook event or Instagram post. Without any additional marketing options (that come at a charge), chances are you will only inform those who already support you. There have never been more possibilities to communicate directly through various digital channels. The more digital channels of communication are being used, the more you can make a difference by simply walking up to people and talking to them directly. Building up a network plays a pivotal role in your communication strategy as a (student) organisation. However, do think beyond your average social media platforms or mailing lists - face-to-face interaction is of crucial importance too. Our VUB student events provide an ideal opportunity to inform people outside of your network as well about who you are and what you are doing, for and by students. We are thus encouraging (student) organisations to speak to fellow students in person - whether this is during lectures, in front of the lecture theatre, on the esplanade, in the student restaurant, or during 'big' VUB events. Corporate life is very important for the student network on our campuses. Therefore, we want to offer active VUB students a 'real life' forum - a chance to participate in bigger VUB student events. We hope to foster contacts between students in this way. Participants of the event are thus invited to discover the many student initiatives that VUB offers. Kick-Off, St-Vé, WeKonekt, the Warmest Week ... make sure to be there! The more VUB organisations and services are participating, the more valuable the event becomes. The VUB kick-off is the ideal networking opportunity at the start of the academic year. Introduce your student service or organisation by means of a fun, creative booth. Kick Off the Campus is an umbrella term for all the welcome activities at the start of the academic year. We welcome students (back) to campus and acquaint them (further) with what the University has to offer in a fun and festive manner. 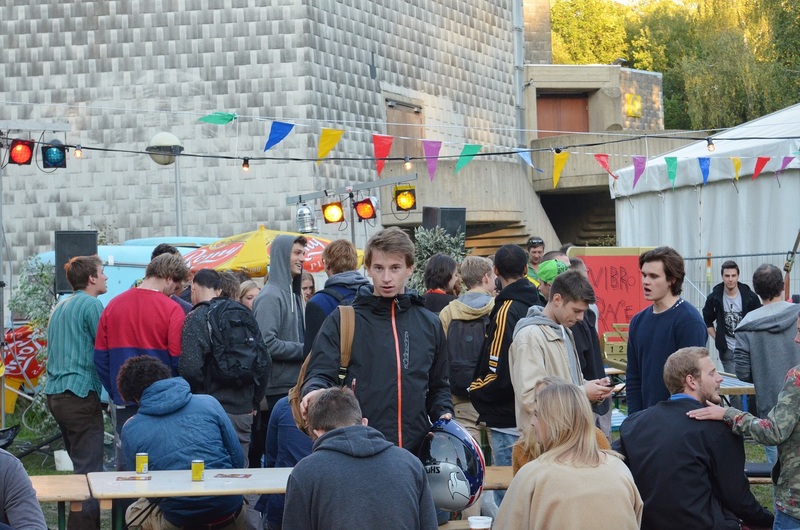 The main focus of the information fair lies on the discovery of student organisations, services, and the range of activities VUB has to offer - all in a cosy atmosphere. In short, it is an event that we create together! Folders, posters, video screens, social media, news updates ... you too can participate in the promotional race at the University. But does it have any beneficial effects in the long run? The information fair provides the perfect opportunity to introduce yourself face-to-face to (new) students, during a chat over a pint. Personal contact still proves its worth. During the kick-off, we aim at uniting all students. It is an ideal opportunity to reach out to them through a fun booth or activity. Reserve your spot on the fair via the form below and request the necessary material. Develop a nice booth with drinks and a bite to eat, an original activity, or a creative gadget. Make sure your booth is worth paying a visit! This is your chance to explain who you are and what you are doing. For student organisations especially the kick-off is an opportunity to reach a great number of students at once. 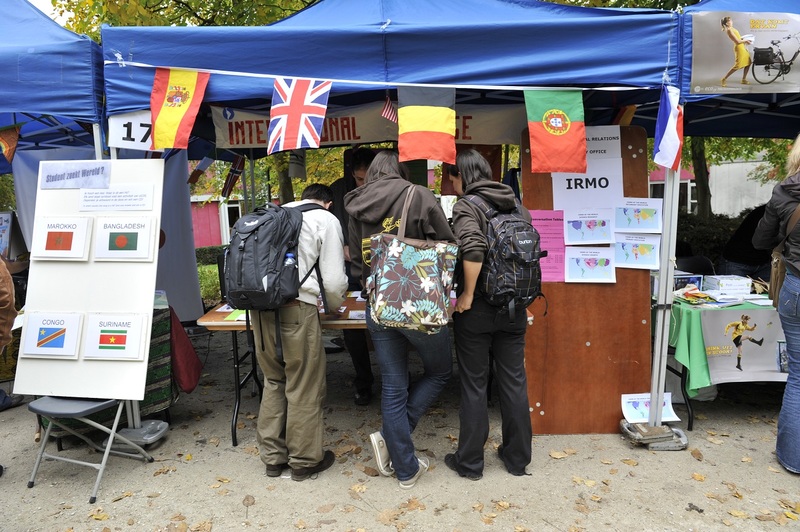 Student Information is the central point of contact for internal exhibitors, i.e. VUB services and student organisations. Pull your weight and win one of our fun prizes for exhibitors, allocated to the most student-friendly VUB service, the most fun booth, the most delicious bite to eat, and the most beautiful presentation. With party buses departing from Jette, there is only one big event left to unite all VUB members. Thanks to our new location, the Esplanade, and the afternoon extended programme, more students can be reached. Marcom remains in charge of the organisation and serves as a point of contact for external partners and sponsors. Thursday 4th October 2018, between 12 noon and 8 pm, Esplanade @ Brussels Humanities, Sciences and Engineering Campus ('Etterbeek'). Party buses departing from Jette. The '24 hours of VUB' is the final event of #vubforlife, which is part of a huge charity run all over Flanders known as the 'Warmest Week'. Similar to our annual Kick-Off the Campus, this event is built on the liberal engagement of all VUB members. Are you organising an activity or a fun booth for charity as well? At the start of the Warmest Week in 2017, the team of Student Information stayed up all night in the University's glass house, building D. In the entrance hall numerous booths by students could be found alongside a general programme of hourly activities. In 2018, we want even more VUB members to get involved. We are therefore calling upon VUB employees and students to either host an activity or to set up a booth during the 24 hours of the event. Would you like to join us on the 17th and 18th December 2018? Contact Student Information and share your idea! Want to get inspired? Check out 2017's edition on our website. Our student seminar "Redelijk Ongeregeld?!" ("Reasonably Unruly") and our meeting nights "Studentikoziteit" ("Student vibes") and "Swaree Engagée" ("A night of commitment") all serve the same purpose: sharing your experiences with active engagement at VUB and learning how you can take and develop initiative at the University. During this one-day conference, active engagament at VUB takes centre stage. You can participate in readings and workshops focusing on skills that might come in handy in the new academic year: meeting techniques, budgeting, time management, organising and communicating, beer tapping, ... At the same time, we treat this conference as an opportunity to honour a number of students. It goes without saying that meeting new people - from Jette and Etterbeek, Belgian and international students - is just as important as the subject matter! This mini version of Redelijk Ongeregeld?! takes place in the Spring and focuses on the 'basics' for the newly elected student representatives and the boards of the VUB student organisations. In 2017, the old and new generation of members belonging to a VUB student organisation met. Current members and ancients held talks in relation to topical themes in student organisation life, and compared old times with the present. During the open days and welcome activities for new students we aim at explaining the workings of the University whilst answering all of your questions. There are three specific 'welcome pathways' tailored specifically to new students, working students, and international students. In accordance with tradition, new students are welcomed on the first day of classes during a big welcome ceremony. Afterwards, students are welcomed by their respective faculties, sometimes accompanied by an activity of the student organisation connected to the faculty. For three weeks, welcome activities take place on our campuses, also known as Kick-Off the Campus. Working students receive a warm welcome on the Saturday before the first week of classes. By then, international students will have completed Orientation Week. We are looking forward to welcoming prospective applicants in the Spring and in September. These open days are designed to give you an opportunity to visit our campuses, and focus on choosing a study programme. In addition, there will be numerous activities to support you in this process. You can find the full calendar on the VUB website. Some of our annual traditions offer you the perfect opportunity to get to know the University better. For many students, the honouring of Saint Verhaegen is their annual party on the Sablon (Zavel). However, during the impressive ceremonies in the morning and the session in the Brussels Town Hall, you can learn a great deal about the historical roots of the University. Therefore, it is certainly worth experiencing. True to tradition, it takes place on 20th November, unless this is a weekend day. Read more. In early December, BSGgtgv organises the Liberal Sing-Song in Auditorium Q. During this festive sing-song, alumni and current students sing liberal songs, which are usually interpretations of existing songs united by a central theme. Read more. New student representatives are elected during the student elections. During the weeks of campaign, candidates try to convince the student electorate of their qualities and programme. The sitting Student Council organises heaps of activities during the Week of the Student Council to shine a spotlight on the elections. VUBrusselt is the flagship of the Student Council's programme, which is a student event in the centre of Brussels. More information. We.Konekt and Mindblowers are two initiatives launched by the current rectorate to underscore the activism and the ties with Brussels. We.Konekt is an umbrella project aimed at civic interaction, whereas Mindblowers heralds the beginning of a cultural and activist academic year. Our annual academic opening is well worth experiencing too. At the Brussels Humanities, Sciences and Engineering Campus, you can participate in 'experience marketing’ all year round through the so-called Esplanade activities on the Esplanade, in building D, or in the restaurant. Those who want to organise an event on campus need approval from Infradesk, who manage all on-campus activities. For smaller activities, however, there is a fast-track procedure through Student Information. You can ask for permission to set up a booth, distribute flyers, or organise a small activity in an area where most students pass by - this could be the Esplanade, building D, or the student restaurant during lunch break. Not only organisations and services, but also individual students can apply. It's always a good idea to walk up to your fellow students for a chat. The Esplanade activities allow you to do this all year round, also outside of big events.